Lenora Lee Dance’s Fire of Freedom opens with twelve simultaneous preludes. Upon arrival, each audience member was assigned to a group and right before the piece started, led to that group’s designated space in the General’s Residence. This was where they would view one of the twelve preludes, which would serve as the beginning of the dance for them. Once that introductory vignette had concluded, the instructions were to roam freely around the building, including the outside grounds. And so, every person would experience Fire of Freedom differently, each with a unique perspective of the world premiere work. 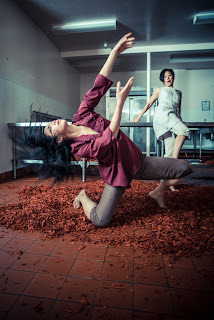 While I cannot speak to what others saw, here are some thoughts and observations based on my own journey through the space and through the dance. 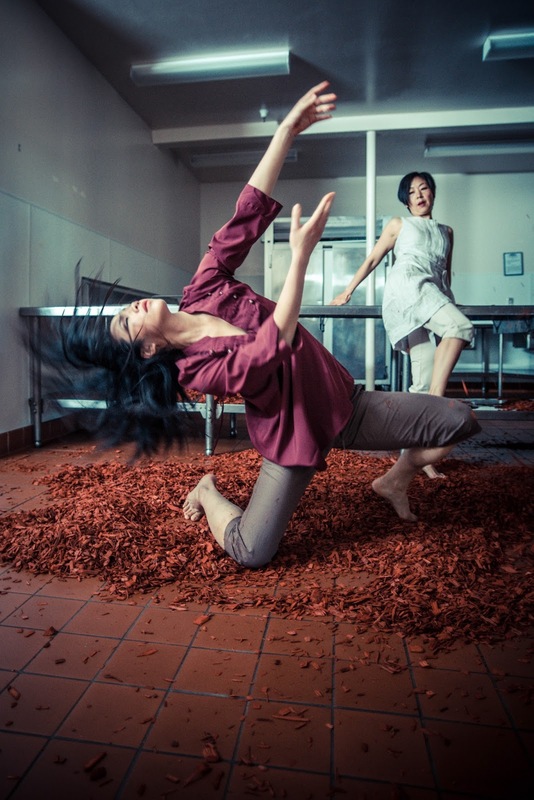 A site-specific, mobile, mixed discipline project, Fire of Freedom was a tapestry of interwoven stories and chapters. They unfolded over the course of an hour, overlapping each other throughout the house. Scenes depicted assault and struggle; rage and aggression; battle and shock. But there was also desire for peace, for hope, for clarity, for rest. For her eighth anniversary season, Lee has crafted a robust narrative work. Fracture and fragmentation were Fire of Freedom’s primary themes, but there were also glimpses of repair and renewal. My group began on the upper floor of the General’s Residence. Costumed in a long white gown, a woman sat at a dresser staring into a mirror. She then cycled through a frenetic choreographic phrase, a combination of whirling, spinning, crawling and writhing. She seemed alarmed and afraid. Perhaps of what awaited her in the next sequence downstairs. As the entire company (and the audience) gathered in the ballroom, a Rite of Spring type scene developed. The bride figure was thrust around the room from one person to another, with no personal agency and no control over her situation. She appeared to initially protest, but eventually submitted to her imposed circumstance. Then, as the cast began to disperse and scatter into various locations, the audience followed suit. In one room, a dancer performed flowy, circular vocabulary while a video of a couple was projected on the screen behind her. Was this a juxtaposition of reality and fantasy? Did it represent two different points in time? Maybe both; maybe neither, but there was definitely a sense of fragmentation. A second video (this time of physical fighting) was shown on the outside of the building while a soloist clung to the handrail and stairs. It seemed as if she was desperately trying to ground herself amidst a chaotic fractured environment. In the final choreographic sequence, the company reassembled, in what appeared to be a moment of repair. Though I wouldn’t describe it as peaceful, the unison movement had a calm meditative intention that felt very aware and mindful. What struck me most about Fire of Freedom was how Lee managed to embed the narrative into the installation’s structure. By not directing the audience to any particular dance or any specific place, the sense of fragmentation and fracture was heightened. So many different things were happening all at once and no one could predict what was going to occur, or when, or where. From time to time the audience looked almost disoriented, wandering around, not knowing where to go next or what to focus on. This is not a criticism; rather, it shows how carefully Lee wove the narrative into everyone’s experience, including the viewer’s. This is what happens when one is fractured – they are disoriented and don’t know what to do. So not only were we watching fragmentation, we were feeling it too. But there was also a drawback to this free mobile structure. You end up getting caught up as the whole group tries to move together. Or you stumble onto choreographic segments as they are concluding. What I saw of the choreography was impressive, and the narrative was strong and powerful throughout. But without some form of guidance, I feel like I only viewed a small fraction of Fire of Freedom, and missed much of the dancing.